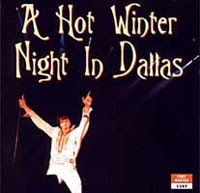 "No Teddy Bear, forget that"
Thanks to eBay I'm now the proud owner of Fort Baxter's CD A Hot Winter Night In Dallas, featuring Elvis' concert in Dallas, December 28, 1976. And, after listening through it, I can understand why it is one of the most popular import records around. I already knew Elvis was in great shape during the five show tour he did in the final month of 1976. After all, what fans haven't heard of or listened to the classic concert in Pittsburgh on New Year's Eve? And, if further proof was needed, we got that with the release of the import CD Burning In Birmingham, recorded on December 29. Therefore, it is no surprise that Elvis delivers the goods in Dallas, too. That, together with great sound quality, makes A Hot Winter Night In Dallas pure listening pleasure. From the first notes of "See See Rider" where he practically throws himself into the song, to the falsetto ending of "Unchained Melody," it’s Elvis at full blast. "No Teddy Bear, forget that," he says at one point and delivers an emotional rendition of "My Way" instead. Then it's right into high gear and "Polk Salad Annie." It's that kind of show. You can read some reviews here and here. When you think about it, it's hard to understand that this is the same guy that eight months earlier stood in front of the crowd in the City Auditorium in Omaha giving an average performance (featured on the recent FTD release America) and that, eight month later, would be dead. I don't know if new girlfriend Ginger Alden was the reason for Elvis transformation, or if it was the pills speaking (or maybe a combination of both). What I do know is that the tour in December was the last time audiences saw Elvis performing passionately and full of energy. This posting was supposed to be about Elvis' concert in Dallas, December 28, 1976. 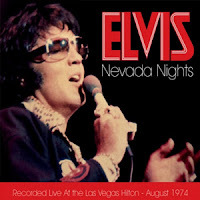 But before I signed in I made my daily visit to ElvisNews.com where the content of the two upcoming FTD releases Nevada Nights and Elvis Country were announced, so I'll write about that instead. It was already known that the 2 CD Nevada Nights would include the Opening Night Show, which is an interesting concert in itself. Turns out I was right in my guess that the other CD will contain another concert from this engagement: the track listing is for the August 21 Midnight Show. Just for the fun of it I compared it with the one already released by FTD under the name It's Midnight from the August 24 Midnight performance. Not very surprisingly they are nearly identical: exclusive for Nevada Nights is an incomplete version of "The First Time Ever I Saw Your Face" whereas "Spanish Eyes," "How Great Thou Art" and "Early Morning Rain" are featured only on It's Midnight. But I don't mind as the concert seems an interesting one. According to both Stein Erik Skar's book The Concert Years and Lee Cotten's Did Elvis Sing In Your Hometown, too? Elvis went over to J.D. Sumner during "Why Me Lord" wearing a pair of huge inflatable feet with black toe-nail polish. As you can probably guess, poor J.D. couldn't continue singing while Elvis doubled over with laughter. Also, the introduction should be something out of the ordinary. And I for one certainly don't mind hearing Elvis belting out great songs such as "Big Boss Man," "It's Midnight," "I'm Leavin'" and "If You Talk In Your Sleep." Bring 'em on! As for Elvis Country, no big surprises, with an equal part of outtakes (many of them already released, the majority on A Hundred Years From Now: Essential Elvis Volume 4 and Nashville Marathon) and undubbed masters. Proof that not many "new" unreleased takes exist is the inclusion of three undubbed masters actually belonging on That's The Way It Is and Love Letters ("When I'm Over You," The Next Step Is Love" and "Love Letters"). If we'll get the original album with the parts of "I Was Born About Ten Thousand Years Ago" between the songs or not, is unclear to me. I for one would have preferred to have the songs first with the snippets and then without. Nevertheless, just like the recenty released TTWII and Love Letters, it will be great to have all what's available collected on 2 CD's. But like someone commented on ElvisNews.com: "What seems to be missing is the long version of Whole Lot-ta Shakin' Goin' On WITHOUT the added horns." Why is that? PS: My next posting will be about Elvis' concert in Dallas, December 28, 1976. I promise. Thanks to my brother I've been listening a lot to the songs recorded for the movie Kid Galahad on October 26-27, 1961. A couple of weeks ago I helped him paint the walls of his new apartment, and last Friday I found a thank you letter together with the two FTD releases Kid Galahad and Follow That Dream in the mail. Really, that was too much, but it made my day as those are some of the last FTD releases I haven't gotten around to buying yet. I immediately phoned my brother to thank him, and among the things we talked about was that the FTD Kid Galahad CD is kind of an official Radio Recorders Revisited, a bootleg I bought some 20 years ago that contains 21 alternate takes from the Kid Galahad session. I've always liked the songs from this session and their happy-go-lucky sound. Admittedly, "Riding The Rainbow" and "I Got Lucky" quality-wise are miles away from "Good Luck Charm" and "Little Sister," but Elvis succeeds into turning them to little gems of listening pleasure. And of course, there is "King Of The Whole Wide World," great stuff, indeed. It's interesting listening to Elvis and the band developing the song, finally settling on a master (take 31), but having another go at it the very next day, ending up with a perfect take. Why the song was originally released without Boots Randolph's second sax solo remains a mystery. After listening to Kid Galahad I gave my old bootleg Radio Recorders Revisited a spin on the turntable. I also compared the information on the cover with that of the Kid Galahad release and was surprised to discover the LP contained many alternate takes not included on the FTD CD. In fact, of the 21 takes presented on the LP, 10 are not found on the FTD release: a complete versions of "King Of The Whole Wide World" (take 29) and another of "Home Is Where The Heart Is" (take 20), amongst others. I also have to mention "Riding The Rainbow" (take 2) where Elvis starts laughing after messing up the lyrics, followed by a fun, fast version of the song (take 8). It was an interesting discovery. I've always thought Ernst Jorgensen included all the available material from the recording sessions on the classic label, at least when it came to complete takes. But with Kid Galahad, this is clearly not the case. A couple of years ago I bought an Elvis board game to one of my brothers. I ordered it from the fan club in Great Britain but it was manufactured in the USA and came with a sticker that said it was a E.P.E. official product. What it also should have had was a sticker saying it's impossible to play if you're not an Elvis expert and that sometimes even that isn't enough. In other words, this is not a game you play with a couple of friends who's not into Elvis Presley. The rules are simple enough: "Answer questions in five separate categories as you relive the magical moments from the live and career of Elvis Presley. Correct answers earn players Gold Record Albums. Be the first to return to Graceland with a collection of five different albums and you win the game!" Not very easy, eh? 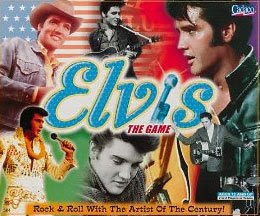 In all fairness, many of the questions are a lot simpler than that, but there are enough of the tough ones to make only the most fanatic of Elvis fans willing to play this game, that's for sure. Me and my brother played it once together with our third brother who's not an Elvis fan, but we haven't touched it since. What the soundboard from February 1973 at the Las Vegas Hilton will be titled is anybody's guess. More certain is the fact that this, Elvis 8 season in Las Vegas, was his weakest up till then. At the time Elvis had problems with his voice and had to cancel 6 of the shows. Another show had him leaving the stage after only 7 songs, with the the Stamps taking over. He did return after a while, and, after singing "Can't Help Falling In Love," sang another four songs. But this wasn't the only show out of the ordinary. During the midnight show on the 18th February, Elvis got really mad when a couple of guys rushed the stage, sending one of them back into the audience with the help of karate. He then had to be held back, and reminded that he had a show to complete. I don't know if that's the show that will be released. Probably not, and probably not the one where he is leaving the stage either (the dinner show on the 15th). But it would make for some interesting listening, don't you think? They say you learn something new every day. Well, I certainly do when I read the excellent Elvis magazine The Man And His Music, and the latest issue is no exception. Not only do I get to know what fans thought of Elvis' evening performance in Philadelphia on June 23, 1974, after just having witnessed it. I also become acquainted with multi-instrumentalist Charlie McCoy and receive a thorough round-up on what's new on the CD front. 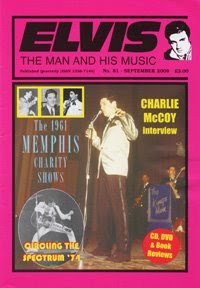 But, best of all, I'm told a lot about the two 1961 Memphis charity shows Elvis gave on February 25 that year. Not much have been documented about these shows, but The Man And His Music gives me 13 pages worth of interviews, pictures, newspapers reviews and repertoire. It's an interesting read, especially the interviews with electric bass player Brad Suggs and Bob Alexius on double bass, both of whom replaced Bill Black. Turned out there wasn't much of a rehearsal, but that didn't worry them too much as the material was "pretty simple stuff". It's a little bit funny that they don't remember being on stage together, I guess it was just another gig for them back then. But as Bob Alexius puts it, "I look back at those shows with regret because I didn't understand what I was part of at the time. I wish I'd paid more attention to it... I wish I had realized that it really was a piece of musical history". With regards to the repertoire, I wasn't aware that Elvis performed "Doin' The Best I Can" from his film G.I. Blues. But that's what I like about The Man And His Music. You always learn something new. Bear with me, I'm not quite finished discussing FTD titles. But I will be short and to the point. Quite a few of the released FTD 5" CD's have alternate titles. Leafing through some of my older fan club magazines from England I noticed that the order forms for coming releases often list another title than the one that was eventually used. Now, why is this? My guess is that these are the working titles, included with the information sent out to the fan clubs. Still, it's interesting that some of them differ so much from the final titles. Man With The Golden Belt is my favorite, a great sounding title that should have been used, in my opinion. And, with reference to my last posting, 5 of the 14 releases mentioned above ended up having the name of a song on the cover. Any idea why?